With school fast approaching, my crafting and reading time is shrinking. I also admit to a preference for cross stitch a few days a week that takes away from knitting, but variety is the spice of crafting! Summer's the only time I can read 2 books at once. I usually read nonfiction in the morning with my coffee and breakfast, then fiction in the afternoon, and mix it up in the evenings. Morning reading time disappears once school starts. I used to get up early to read, but the last few years, I've traded that time for sleep. I would like to continue my nonfiction reading though. I'm almost finished with The Happiness Project by Gretchen Rubin and Yellow Brick War by Danielle Paige. 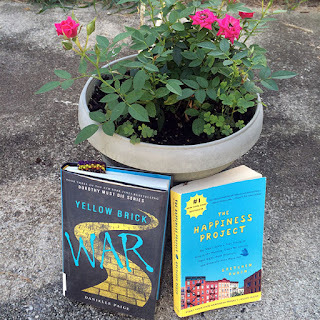 Yellow Brick War is the third book in the Dorothy Must Die series, and if you are a Wizard of Oz fan, you will love it! It turns out Dorothy returned to Oz and became a fascist dictator. The Lion, the TinMan, and the Scarecrow are all evil too (beware that Tin Man), and it's up to Amy Gunn, awkward outcast from modern day Kansas and tornado survivor to kill Dorothy. Today, I'm linking up with Nicole and Keep Calm Craft On. On Wednesdays, I participate in the Yarn Along on Ginny Sheller's blog. Please join us either by contributing a link to your fibery work in progress and current read and / or by checking out the posts to the link parties. You may find your next book or project waiting for you! I'm reading a fantasy book around the afternoon and a fictional book in the evening. I cannot possibly get those two mixed up in my head. I prefer to read one at a time. I don't know why... lovely shawl!! That's exactly why I do one fiction, one nonfiction - otherwise I would definitely get the stories and characters mixed up! 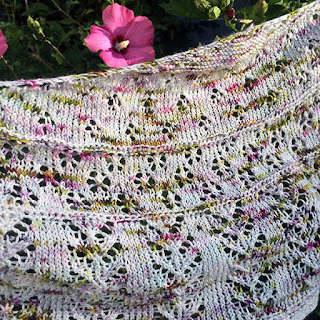 Thanks re: shawl - the pattern is really beautiful and fun to knit up. Just enough lace without making you crazy! I would like to read The Happiness Project. I recently read The Happiness Dare and loved it! I'm hoping to start a cross stitch project soon. Do you have a favorite online shop for cross stitch patterns and supplies? I haven't read "The Happiness Dare" but have heard good things - I'm sure I will get to it this fall! I don't have a favorite online shop necessarily, but I am crazy about Country Cottage Needlecraft patterns these days. I just finished the August Cottage (there's a pic on an earlier blog post) - it was fun and quick. I admit, if I find a pattern I like, I look on eBay and etsy first to see if I can get a bargain, then 123stitch if I have to buy online. I usually buy my floss from the big box stores and limit myself to DMC. I really don't need another expensive hobby, and the specialty flosses get pricey. I did get my first cross stitch pattern after 20 years this spring from the SimpleSmart shop on etsy. Quick PDF download and a nice simple pattern to get back into cross stitch! Your shawl is gorgeous! I think that yarn is just perfect. I can read a book and listen to a book at the same time. That's about as multi-tasked as I can get! Oh that lace! Swoon. I preferred the Happiness Project to 7, too. I'm definitely at a point in my life that the day to day reality won't change much, so find the simple small things to dwell and rejoice in are really important to me. Lovely shawl! Beautiful yarn! Great books! I have been trying to read more non-fiction lately. 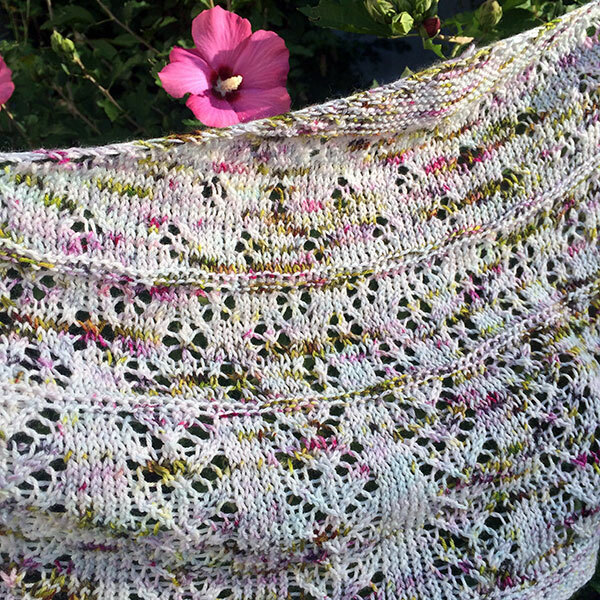 Your shawl is beautiful, I love the yarn! Thank you for sharing at The Really Crafty Link Party this week. Pinned!